Additional Info: Originally from Mebane, North Carolina, Justin Ward continues to enjoy a growing reputation for his work in sacred music and liturgical scholarship. In addition, he maintains an active performance schedule as a soloist, accompanist, and conductor. Most recently, his engagements have included both solo and collaborative performances throughout both the United States and abroad. Among his international performance venues are Russia, China, England, France and Italy. Justin earned both the Bachelor and Master of Church Music degrees from Samford University. His principal organ teachers have included Charles Hogan, H.E. Tibbs and James Dorroh. Additionally he has been coached by numerous famed organists including Bruce Neswick, Gerre Hancock, David Craighead, Christoph Wolf, and Dame Gillian Weir. He has studied conducting extensively under Milburn Price and Timothy Paul Banks. Ward has received numerous scholarship awards and recognition from various professional organizations including the American Choral Directors Association and American Guild of Organists. Ward has served on the music staffs of several parishes throughout the southeast as well as on the music staff of the EWTN in Birmingham, AL. 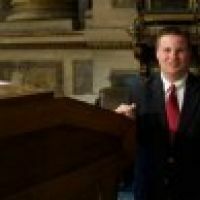 In June 2009, he was appointed Director of Liturgy and Music at the Cathedral of Saint John Berchmans (RC) in June 2009 where he oversees a comprehensive music program of six choirs and collaboration with the music staff, is continuing to build a model liturgical music program for the Roman liturgy.